Low prices. OrangeSmile.com offers car hire service in Liechtenstein on the lowest-rate-guarantee basis, since we work with car suppliers directly. For your search criteria in Liechtenstein, we always select and show the best rental offers. The car reservation process consists of 3 simple steps: (1) search for available cars for your dates in Liechtenstein; (2) select your car type; and (3) fill in the booking forms. Once the reservation is completed, you will receive a confirmation voucher to your email address. During the booking process, please check your rental conditions. To pick up your car at the rental point in Liechtenstein, you need to provide our confirmation voucher, your driving license and a valid credit card. The final payment is normally carried out at the pick-up point. Our car hire points in Liechtenstein accept VISA, MasterCard, etc - please check your rental conditions. At the pick-up point, please read the handling manual and check the car for present defects. 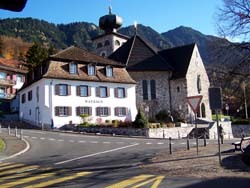 OrangeSmile.com wishes you a pleasant journey to Liechtenstein! The car hire reservation system OrangeSmile.com allows renting a vehicle in Liechtenstein within 10 minutes. Our largest database of car suppliers enables us to provide you a rental car in Liechtenstein at the cheapest rate ever possible. At rental locations in Liechtenstein we offer the following car sizes: mini, compact, economy, standard, premium and luxury. The following car types are available in Liechtenstein: Sedan, Hatchback, Jeep, Cabriolet, Coupe, Minivan and Minibus. The size of this unique European country is smaller than many capitals. Despite that, Lichtenstein never ceases to amaze its guests with its unforgettable beauty and numerous nature and historical sights. One fifth of the country’s territory is covered by forests. Vineyards, spacious pastures, agriculture fields and small charming villages and towns can be seen everywhere in the country. The majority of towns are concentrated in the Rheine River region. Here tourists will see numerous old buildings with unusual tiled roofs, beautiful bridges and boulevards. An interesting peculiarity – there is a flower bed in front of nearly every house. There are so many flowers in towns of Lichtenstein that towns look more like big blooming gardens. The most interesting historic buildings can be found in the city of Vaduz, the capital of Lichtenstein. During the medieval period, the city was used as an important protective point. At that time, the city looked more like a big fortress. The remaining buildings of that period can be found in the old part of the city. Vaduz Castle, the official residence of the Prince of Liechtenstein, is the most notable landmark of the city. The castle was built in the 9th century. The first hotel in the country is also located in Vaduz and it is still working. It is named Gasthof Lowen hotel, and it is highly valued by its guests due to luxurious historic design. There is a large vineyard right in front of the hotel. Best sorts of grape are grown here to be turned into amazing wine at the local vinery. When it comes to describing wine, we simply cannot fail to mention the importance of Vaduz Vinery that is known as one of the best vineries in Europe. This is not only a place to sample amazing wine, but also a beautiful architectural landmark. The buildings of the vinery were constructed several centuries ago and are surrounded by magnificent parks and groves. The National Museum remains the biggest cultural facility in the country. In the museum, visitors will find collections of coins, weapons, folklore items and other precious artefacts. A visit to the Museum of Post Stamps will be no less interesting. Some of the items exhibited date back to the beginning of the 20th century. Art connoisseurs are recommended to visit the Art Museum that exhibits many precious drawings by famous artists. Finally, a town of Triesenberg is a great place to attend several interesting excursions. Experienced guides will show you several historic churches, magnificent nature parks and the local Museum of Ethnography. The “Break Down Assistance” package is already included in the rental price of the majority of our offers. However, it is still recommended to check this information by reviewing the rental terms. If the package is not included, you can order it directly at the rental office in Liechtenstein.